The Tasmanian Museum and Art Gallery (TMAG) recognises life-long learning is at the core of the visitor experience in a museum and art gallery. TMAG's Centre for Learning and Discovery provides a range of programs and resources to help visitors get the best enjoyment and understanding from the museum and to help visitors of all ages engage with Tasmania’s natural and cultural heritage. Learning and Discovery programs are delivered by our AccessArt (dealing with the Arts) and Museum Discovery (dealing primarily with Cultural Heritage and the Sciences) teams. 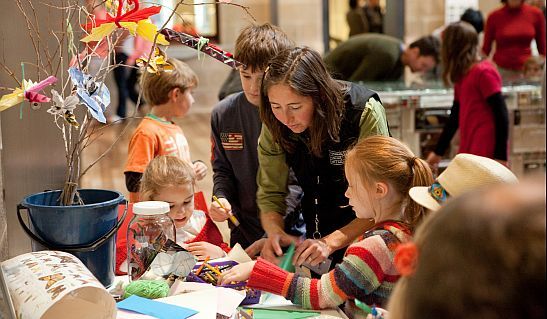 The programs fall broadly into four categories: formal education programs, family learning, community participation and general visitor programs. In addition to programs within TMAG’s galleries, outreach programs as well as a loan service are available to schools and other groups to ensure that Tasmania’s State Collection is accessible across the state. As well as guided gallery programs, a range of online resources related to TMAG exhibitions has been created to allow teachers to conduct high value education programs within the museum and art galleries at any time. The Centre for Learning and Discovery’s dedicated program delivery space in the first floor of TMAG’s visitor services hub is also available for selected programs and allows groups to enjoy a wider variety of programs within the museum than ever before. Most Centre for Learning and Discovery programs and resources are available free of charge, and guided learning programs are open to government and non-government schools. Bookings are required for all programs and group visits, and loan resources. The Centre for Learning and Discovery also administers the Children’s Reference Panel, a select group of children and youth who are interested in contributing to the work of TMAG through providing advice, feedback and recommendations. This page was last modified on 5th February 2016.